Have you noticed that you have problems to concentrate on your work because you feel much stressed? Are you looking for an alternative to feel more satisfied and regulate the stress you feel in work situations? It is common that today we feel saturated due to the workload and the lack of time to comply with it; which in turn generates little satisfaction with our work activities and low productivity. In an era in which we live with many distractions and pending work, the idea of ​​managing time is being left behind, to give way to the management of attention and stress reduction. Mindfulness is a practice that allows us to train our attention and at the same time manage stress. So below we present 5 tips to carry out the mindfulness workshop to your daily life and have a healthier and less stressful work day. Practice “strategic acceptance”:when you notice that your level of stress is increasing, do not try to force yourself to be happy or calm down at all costs. The first step to returning to balance is simply to accept what you are feeling at that moment. This does not mean that you should resign yourself to a bad work situation, but it is to accept how things are at the moment before planning what you can do to improve it. It is called “strategic acceptance” because it is done in the heat of battle; that is, at the moment when a stressful situation arises. 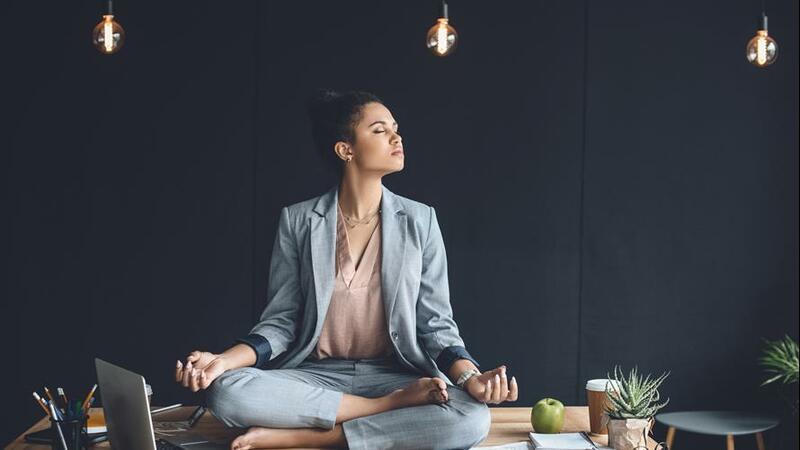 Try giving yourself a space to breathe for 3 minutes : At your desk or in a quiet place it takes three minutes, stop doing the activity you are doing and inhale and exhale deeply, take your attention to the breath and your body as a whole. Go back to the activity you were doing consciously. This practice will help you to clarify your thoughts, to reassure your global approach to life, as well as to be more productive by being present and informed about what happens. You can do it 2 -3 times a day. Tune into the distractions that are around you:in the offices it is common to have many distractors, whether your co-worker is very noisy or the phones ring constantly, etc. One way to prevent these sounds from stressing you is to pay attention to the distractors instead of trying to turn them off or “not listen”. Gently note the sounds and see if you are aware of the effects they have on your body. Take regular breaks: There is evidence that taking regular breaks during the workday promotes productivity and increased creativity. These pauses allow the mind to have space to “digest” the information. For this it is important to take these spaces consciously, which is different from getting lost in our thoughts or concerns. In case you can not get away from your desk, try a 30-second meditation when reading your e-mail. Find a time to disconnect: it has been found that excessive dependence on technology can make us more distracted, impatient and forgetful. To disconnect from technology, try to leave any electronic device away when you do an activity such as eating, exercising, talking with someone else. Consider taking a full afternoon of the weekend to disconnect and return to your work. You can even consider taking a one-day or weekend retreat to detoxify yourself from the digital world.